On behalf of admin of JML Law, A Professional Law Corporation posted in Police Misconduct on Thursday, Dec 14 2017. In what came as a victory for all advocates of police body cameras, also came as a failure of justice. The killing of Daniel Shaver became one of the most terrifying and outrageous police shootings ever captured on camera. But apparently, the shocking Daniel Shaver shooting footage, where the victim gets shot five times while clearly posing no threat, was not enough evidence to charge the officer with police misconduct. The horrific police misconduct case took place in January 2016 in Mesa, Arizona. And while if there was no footage, the police officer, Philip Brailsford, could have justified the killing of Daniel Shaver by saying that the man resisted arrest, the entire encounter was captured on a police body camera with clear audio and visuals. Although Officer Brailsford was terminated from his policing job, an Arizona jury failed to return a guilty verdict for the officer. No police misconduct charges were filed, contributing to the public’s ever-growing distrust of police and law enforcement. The vicious police shooting took place after Officer Brailsford and his partner, Sgt. Charles Langley, had responded to a call that a male suspect was pointing a rifle out the window of a hotel. Officer Brailsford and Sgt. Langley then arrived in hotel, called up to the room where the alleged suspect was, and told him and his female occupant to exit their room. On their way to the room, the police officers encountered Shaver and the female in the hallway. 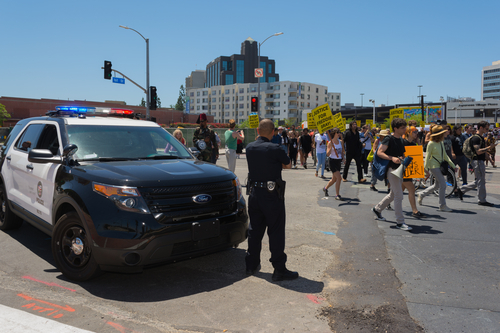 The video of Daniel Shaver’s shooting shows that the police officers abused their force, and Officer Brailsford could be held liable for police misconduct and wrongful death, our Los Angeles police misconduct attorneys at JML Law explain. However, a jury cleared Officer Brailsford of all criminal charges earlier in December, indicating that the problem of police impunity remains widespread in Los Angeles, Riverside, Mesa and elsewhere across our nation. If even the most obvious police abuse of force – that was captured on camera – isn’t a sufficient proof to charge police officers with police misconduct, then what is? Did Daniel Shaver resist arrest during the shooting? As seen from the Daniel Shaver’s shooting footage, Shaver showed all signs of compliance and didn’t pose any threat to the police officers. Furthermore, the police surely realized that the suspect was terrified and inebriated at the time of the arrest, which is why his movements may have been a little wobbly. But it’s not like the police officers weren’t responsible for Shaver’s wobbly behavior, as they demanded him not to move after repeatedly ordering him to move. Their commands were contradictory and hostile, and in no way were they in line with arrest procedures. The shooting itself wasn’t unjustifiable, as Shaver did absolutely nothing that would seem threatening or disobedient. In his official police report after the shooting, Officer Brailsford claimed he shot the victim because he thought he was reaching for a gun. What Shaver was reaching for were his shorts that would have come off while crawling. All Shaver wanted to do was to pull his shorts up, because he didn’t want to crawl down the hallway half-naked. Could something like that happen in Los Angeles? During their interaction, Shaver was terrified but compliant. But it didn’t stop the police officers from using unjustifiably rude language. At one point, the victim even begged the officers, “please do not shoot me,” and could be heard sobbing. Our police misconduct attorneys at JML Law have reviewed Shaver’s tone and body language during the deadly interaction: and in no way were his actions or words threatening or disobedient. But that didn’t stop the police officers from shooting the father of two young children. Could something like this happen in Los Angeles? Absolutely, our Los Angeles police misconduct lawyers say, adding that numerous similar cases take place in the Californian city every year. Most police misconduct, police brutality and shooting cases are kept under wraps and aren’t as publicized as the case of Daniel Shaver. But nonetheless, holding a police officer accountable for his/her unlawful actions is real, whether your civil rights were violated in Los Angeles or Mesa. If you or your loved one were injured or your family member died at the hands of a police officer or law enforcement official, contact our attorney at JML Law immediately. We respect your right to confidentiality, and we are prepared to fight tooth and nail for your civil rights. Call our Los Angeles officers at 818-610-8800 or send email to get a free initial consultation.